When you cross the bridge to the Cape, day to day stresses remain on the other side of the canal. The fresh salty air calms you; the casual pace refreshes you. The Cape is a special place to do nothing at all or to do more than you could possibly imagine. Jutting 65 miles east and north into the Atlantic Ocean, this narrow spit of land is surrounded by three bodies of water: the Atlantic Ocean on the east, Cape Cod Bay on the north and Nantucket Sound on the south. With 560 miles of gorgeous sand-duned beaches and numerous ponds, water activities are plentiful: fishing, boating, windsurfing and whale watching are all popular pastimes. More of a land-lover? Hiking and biking trails run through most of the Cape's 15 diverse towns and the usually temperate climate makes this an almost year round haven for golfers. Summer family traditions include Cape Cod Baseball League games (complete with hot dogs!) and rousing games of miniature golf. Town festivals, fireworks and parades continue to create memories for generations! Over the years, the Cape's breathtaking landscape has inspired artists like Edward Hopper and served as muse for writer Henry David Thoreau, Pulitzer Prize winner Norman Mailer and playwright Eugene O’Neill. Their legacy: a plethora of art galleries, museums and local theater companies. 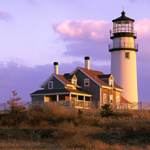 It’s no wonder Cape Cod has been recognized as one of the top 25 arts destinations in the nation!